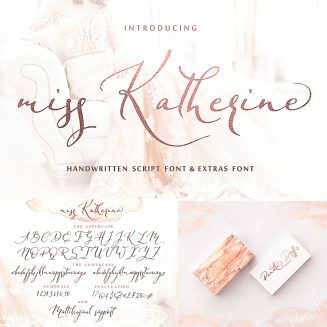 Introducing Miss Katherine Script. Miss Katherine is a graceful, feminine, calligraphic handwritten script font. Its charming elegant style makes it perfect for use in your wedding invitations design, monograms, blog headlines or cards. Cyrillic typeface included. Tags: cyrillic font, cyrillic script, love font, modern calligraphy, romantic font, wedding font.